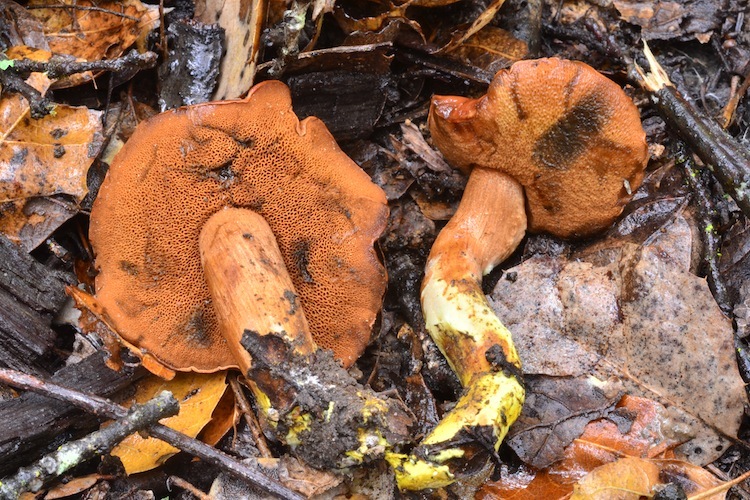 Chalciporus is an easily recognized genus of boletes - not only are the fruitbodies tiny (unlike most boletes), they have coppery-colored pores and a peppery taste (unlike any other local boletes), as well as bright yellow basal mycelium. Both species in our area are ectomycorrhizal with pine trees. There is a documented association between occurrence of Chalciporus and Amanita muscaria wherever it occurs around the world (even in areas where it is introduced, such as New Zealand!). Although this looks pretty suggestive of a parasitism, the exact nature of the relationship has yet to be proven. Important identification characters distinguishing the genus from other boletes are the pore color, taste, and bright yellow mycelium. The presence or absence of a blue bruising reaction on the pores distinguishes the two species that occur locally.